All of my short life, I've heard all sorts of things about Kona coffee. I've heard that "it's simply the best coffee...ever" and that no matter what the price, it's worth it for a pure Kona (i.e. certified to have no other kinds of coffee). And yet, I've also heard that it is the most over-hyped coffee and that similarly wonderful coffees can be found from other origins at a much cheaper premium. But for what it's all worth, I never really gathered the appropriate impetus to push me to seek out a quality 100% Kona to put to the test. Then fortunately out of the blue, I recently received an offer from 100% Hawaiian Kona Coffee (part of C&C Specialty Coffee) to try out their 100% Kona, to which I heartily agreed to sample. The coffee came in it's bright red bag with a golden seal of certification. The roast was of a light to medium roast and when I ground it up, the Kona produced the lovely aroma of bright floral notes and berries. When I first brewed it via french press, the aromas played out quite delectably in the cup, along with some watermelon and some massive brightness. The vacuum pot produced a deeper cup accompanied by a little more watermelon. The drip also produced a smooth beverage, with a pleasant brightness and delightful acidity. While I felt that the coffee held up to the substantial hype of pure Kona coffees, I can't say I would make it an every week purchase (little pricey). 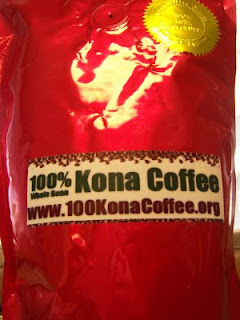 So if/when you're looking to try out a good pure Kona, give 100% Hawaiian Kona Coffee a run for your money. Solid post. I agree with your assessment. No matter how many blends or special roasts I try, I always come crawling back to the pure driven soot of Kona. Love that stuff. But, yes, I little pricey. For coffee houses, let me know what you'd recommend in L.A. I'm always up to try something new. Kona Coffee has developed a reputation making it one of the most expensive and sought after coffees in the world. Only Coffee from the Kona Districts of Hawaii can legally be described as Kona. just because coffee is labeled as organic does not mean it is or isnt. You can still use pesticides just a certain amount and still be certified organic and you could use none at all but not have paid a $250.00 licensing fee to get certified so best is to always ask your specific vendor their methods of production. Despite the expensive price of Kona Coffee, in my opinion it is one of the best tasting coffee I have tasted. I have tried other brands of coffee but in the end, I think Kona coffee is worth every cent with regards to its quality and taste. completely agree about the hype. there's certainly potential for great coffee in the region but Hawaii has many coffee growing regions worthy of experience and distinction. most Konas i try are simply over-roasted, flat/soft in the cup and empty in the finish. and enough of the "volcanic soil" pitch already! MOST places in the world where coffee is grown (mountains) are or were volcanoes. the cup does not lie. it CAN be worth the price but you have to research and not get sucked into the hype. they do very nice work and are very reasonable in price. great customer service too. worth checking out to get a taste of Hawaii's other offerings. The thing is that 100% pure kona coffee is really good! It has health benefits like prevention of colon cancer, asthma, reduce diabetes risk etc. This is really a nice post, nice to read it. Love to drink 100% pure kona coffee. Keep sharing and many thanks for sharing. Love my morning cup of coffeek. I recently found Kona coffee and now I really LOVE my coffee. Cool post. Thank you.